Liczba stron: 435 Jest to ujednolicona liczba stron, która ułatwi Ci porównanie długości książek. Każda strona Legimi to 200 słów. The first invitation I ever received into a purely Parisian interior might have been copied out of a novel by Paul Bourget. Its lure was thus phrased: “Un peu de musique et d’agréables femmes.” It answered to my inward vision of Paris. My experiences in London, which fifteen years earlier I had entered with my mouth open as I might have entered some city of Oriental romance, had, of course, done little to destroy my illusions about Paris, for the ingenuousness of the artist is happily indestructible. Hence, my inward vision of Paris was romantic, based on the belief that Paris was essentially “different.” Nothing more banal in London than a “little music,” or even “some agreeable women”! But what a difference between a little music and un peu de musique! What an exciting difference between agreeable women and agréables femmes! After all, this difference remains nearly intact to this day. Nobody who has not lived intimately in and with Paris can appreciate the unique savour of that word femmes. “Women” is a fine word, a word which, breathed in a certain tone, will make all men—even bishops, misogynists, and political propagandists—fall to dreaming! But femmes is yet more potent. There cling to it the associations of a thousand years of dalliance in a land where dalliance is passionately understood. The usual Paris flat, high up, like the top drawer of a chest of drawers! No passages, but multitudinous doors. In order to arrive at any given room it is necessary to pass through all the others. I passed through the dining-room, where a servant with a marked geometrical gift had arranged a number of very small plates round the rim of a vast circular table. In the drawing-room my host was seated at a grand piano with a couple of candles in front of him and a couple of women behind him. See the light glinting on bits of the ebon piano, and on his face, and on their chins and jewels, and on the corner of a distant picture frame; and all the rest of the room obscure! He wore a jacket, negligently; the interest of his attire was dramatically centred in his large, limp necktie; necktie such as none hut a hero could unfurl in London. A man with a very intelligent face, eager, melancholy (with a sadness acquired in the Divorce Court), wistful, appealing. An idealist! He called himself a publicist. One of the women, a musical composer, had a black skirt and a white blouse; she was ugly but provocative. The other, all in white, was pretty and sprightly, but her charm lacked the perverseness which is expected and usually found in Paris; she painted, she versified, she recited. With the eye of a man who had sat for years in the editorial chair of a ladies’ paper, I looked instinctively at the hang of the skirts. It was not good. Those vague frocks were such as had previously been something else, and would soon he transformed by discreet modifications into something still else. Candlelight was best for them. But what grace of demeanour, what naturalness, what candid ease and appositeness of greeting, what absence of self-consciousness! Paris is the self-unconscious. I was presented as le romancier anglais. It sounded romantic. I thought: “What a false impression they are getting, as of some vocation exotic and delightful! If only they knew the prose of it!” I thought of their conception of England, a mysterious isle. When Balzac desired to make a woman exquisitely strange, he caused her to be born in Lancashire. When there were a dozen or fifteen people in the room, and as many candles irregularly disposed like lighthouses over a complex archipelago, I formed one of, a group consisting of those two women and another, a young dramatist who concealed his expressive hands in a pair of bright yellow gloves, and a middle-aged man whose constitution was obviously ruined. This last was librarian of some public library—I forget which—and was stated to be monstrously erudite in all literatures. I asked him whether he had of late encountered anything new and good in English. “I have read nothing later than Swinburne,” he replied in a thin, pinched voice—like his features, like his wary and suffering eyes. Speaking with an icy, glittering pessimism, he quoted Stendhal to the effect that a man does not change after twenty-five. He supported the theory bitterly and joyously, and seemed to taste the notion of his own intellectual rigidity, of his perfect inability to receive new ideas and sensations, as one tastes an olive. The young dramatist, in a beautifully curved phrase, began to argue that certain emotional and purely intellectual experiences did not come under the axiom, but the librarian would have none of such a reservation. Then the women joined in, and it was just as if they had all five learnt off by heart one of Landor’s lighter imaginary conversations, and were performing it. Well convinced that they were all five absurdly wrong, fanciful, and sentimental either in optimism or pessimism, I nevertheless stood silent and barbaric. Could I cut across that lacework of shapely elegant sentences and apposite gestures with the jagged edge of what in England passes for a remark? The librarian was serious in his eternal frost. The dramatist had the air of being genuinely concerned about the matter; he spoke with deference to the librarian, with chivalrous respect to the women, and to me with glances of appeal for help; possibly the reason was that he was himself approaching the dreadful limit of twenty-five. But the women’s eyes were always contradicting the polite seriousness of their tones. Their eyes seemed to be always mysteriously talking about something else; to be always saying: “All this that you are discussing is trivial, but I am brooding for ever on what alone is important.” This, while true of nearly all women, is disturbingly true of Parisians. The ageing librarian, by dint of freezing harder, won the altercation: it was as though he stabbed them one by one with a dagger of ice. And presently he was lecturing them. The women were now admiring him. There was something in his face worn by maladies, in his frail physical unpleasantness, and in his frigid and total disgust with life, that responded to their secret dream. Their gaze caressed him, and he felt it falling on him like snow. That he intensely enjoyed his existence was certain. They began talking low among themselves, the women, and there was an outburst of laughter; pretty giggling laughter. The two who had been at the piano stood aside and whispered and laughed with a more intimate intimacy, struggling to suppress the laughter, and yet every now and then letting it escape from sheer naughtiness. They cried. It was the fou rire. Impossible to believe that a moment before they had been performing in one of Landor’s imaginary conversations, and that they were passionately serious about art and life and so on. They might have been schoolgirls. “Farceuses, toutes les deux!” said the host, coming up, delightfully indulgent, but shocked that women to whom he had just played Ygdrasil, should be able so soon to throw off the spell of it. The pretty and sprightly woman, all in white, despairing, whisked impulsively out of the room, in order to recall to herself amid darkness and cloaks and hats that she was not a giddy child, but an experienced creature of thirty if she was a day. She came back demure, her eyes liquid, brooding. He had a project for giving performances of the finest music to the populace at a charge of five sous per head. It was the latest activity of the publicist in him. The committee appeared to consist of everybody who was standing near. He drew me into it, because, coming from London, I was of course assumed to be a complete encyclopædia of London and to be capable of furnishing detailed statistics about all twopence-halfpenny enterprises in London for placing the finest music before the people. The women, especially the late laughers, were touched by the beauty of the idea underlying the enterprise, and their eyes showed that at instants they were thinking sympathetically of the far-off “people.” The librarian remained somewhat apart, as it were with a rifle, and maintained a desolating fire of questions: “Was the scheme meant to improve the people or to divert them? Would they come? Would they like the finest music? Why five sous? Why not seven, or three? Was the enterprise to be self-supporting?” The host, with his glance fixed in appeal on me (it seemed to me that he was entreating me to accept him as a serious publicist, warning me not to be misled by appearances)—the host replied to all these questions with the sweetest, politest, wistful patience, as well as he could. Certainly the people would like the finest music! The people had a taste naturally distinguished and correct. It was we who were the degenerates. The enterprise must be and would be self-supporting. No charity! No, he had learnt the folly of charity! But naturally the artists would give their services. They would be paid in terms of pleasure. The financial difficulty was that, whereas he would not charge more than five sous a head for admission, he could not hire a hall at a rent which worked out to less than a franc a head. Such was the problem before the committee meeting! Dufayel, the great shopkeeper, had offered to assist him.... The librarian frigidly exposed the anti-social nature of Dufayel’s business methods, and the host hurriedly made him a present of Dufayel. Dufayel’s help could not be conscientiously accepted. The problem then remained!. . . London? London, so practical? As an encyclopaedia of London I was not a success. Politeness hid a general astonishment that, freshly arrived from London, I could not suggest a solution, could not say what London would do in a like quandary, nor even what London had done! “We will adjourn it to our next meeting,” said the host, and named day, hour, and place. And the committee smoothed business out of its brow and dissolved itself, while at the host’s request a girl performed some Japanese music on the Pleyel. When it was finished, the librarian, who had listened to Japanese music at an embassy, said that this was not Japanese music. “And thou knowest it well,” he added. The host admitted that it was not really Japanese music, but he insisted with his plaintive smile that the whole subject of Japanese music was very interesting and enigmatic. Then the pretty sprightly woman, all in white, went and stood behind an arm-chair and recited a poem, admirably, and with every sign of emotion. Difficult to believe that she had ever laughed, that she did not exist continually at these heights! She bowed modestly, a priestess of the poet, and came out from behind the chair. “By whom?” demanded the librarian. But I knew, from the tone alone of the answering voice, that the name of Henri de Régnier was a sacred name, and that when it had been uttered the proper thing was to bow the head mutely, as before a Botticelli. “I have something here,” said the host, producing one of these portfolios which hurried men of affairs carry under their arms in the streets of Paris, and which are called serviettes; this one, however, was of red morocco. The pretty, sprightly woman sprang forward blushing to obstruct his purpose, but other hands led her gently away. The host, using the back of the arm-chair for a lectern, read alternately poems of hers and poems of his own. And he, too, spoke with every sign of emotion. I had to conquer my instinctive British scorn for these people because they would not at any rate pretend that they were ashamed of the emotion of poetry. Their candour appeared to me, then, weak, if not actually indecent. The librarian admitted occasionally that something was pretty enough. The rest of the company maintained a steady fervency of enthusiasm. The reader himself forgot all else in his increasing ardour, and thus we heard about a score of poems—all, as we were told, unpublished—together with the discussion of a score of poems. We all sat around the rim of an immense circle of white tablecloth. Each on a little plate had a portion of pineapple ice and in a little glass a draught of Asti. Far away, in the centre of the diaper desert, withdrawn and beyond reach, lay a dish containing the remains of the ice. Except fans and cigarette-cases, there was nothing else on the table whatever. Some one across the table asked me what I had recently finished, and I said a play. Everybody agreed that it must be translated into French. The Paris theatres simply could not get good plays. In a few moments it was as if the entire company was beseeching me to allow my comedy to be translated and produced with dazzling success at one of the principal theatres on the boulevard. But I would not. I said my play was unsuitable for the French stage. I had meant to be mildly jocular. But this joke excited mirth that surpassed mildness. “Thou hearest that? He says his play is too pure for us!” My belief is that they had never heard one of these strange, naïve, puzzling barbarians make a joke before, and that they regarded the thing in its novelty as really too immensely and exotically funny, in some manner which they could not explain to themselves. Beneath their politeness I could detect them watching me, after that, in expectation of another outbreak of insular humour. I might have been tempted to commit follies, had not a new guest arrived. This was a tall, large-boned, ugly, coquettish woman, with a strong physical attractiveness and a voice that caused vibrations in your soul. She was in white, with a powerful leather waistband which suited her. She was intimate with everybody except me, and by a natural gift and force she held the attention of everybody from the moment of her entrance. You could see she was used to that. The time was a quarter to midnight, and she explained that she had been trying to arrive for hours, but could not have succeeded a second sooner. She said she must recount her journée, and she recounted her journée, which, after being a vague prehistoric nebulosity up to midday seemed to begin to take a definite shape about that hour. It was the journée of a Parisienne who is also an amateur actress and a dog-fancier. And undoubtedly all her days were the same: battles waged against clocks and destiny. She had no sense of order or of time. She had no exact knowledge of anything; she had no purpose in life; she was perfectly futile and useless. But she was acquainted with the secret nature of men and women; she could judge them shrewdly; she was the very opposite of the ingénue; and by her physical attractiveness, and that deep, thrilling voice, and her distinction of gesture and tone, she created in you the illusion that she was a capable and efficient woman, absorbed in the most important ends. She sat down negligently behind the host, waving away all ice and Asti, and busily fanning both him and herself. She flattered him by laying her ringed and fluffy arm along the back of his chair. The host seemed to be thunderstruck by this piece of information. The whole table was agitated by it, and a tremendous discussion was set on foot. I then witnessed for the first time the spectacle of a fairly large mixed company talking freely about scabrous facts. Then for the first time was I eased from the strain of pretending in a mixed company that things are not what they in fact are. To listen to those women, and to watch them listening, was as staggering as it would have been to see them pick up red-hot irons in their feverish, delicate hands. Their admission that they knew everything, that no corner of existence was dark enough to frighten them into speechlessness, was the chief of their charms, then. It intensified their acute femininity. And while they were thus gravely talking, ironical, sympathetic, amused, or indignant, they even yet had the air of secretly thinking about something else. Discussions of such subjects never formally end, for the talkers never tire of them. This subject was discussed in knots all the way down six flights of stairs by the light of tapers and matches. I left the last, because I wanted to get some general information from my host about one of his guests. The filth and the paltry shabbiness of the entrance to the theatre amounted to cynicism. Instead of uplifting by a foretaste of light and magnificence, as the entrance to a theatre should, it depressed by its neglected squalour. Twenty years earlier it might have cried urgently for cleansing and redecoration, but now it was long past crying. It had become vile. In the centre at the back sat a row of three or four officials in evening dress, prosperous clubmen with glittering rakish hats, at a distance of twenty feet, but changing as we approached them to indigent, fustian-clad ticket-clerks penned in a rickety rostrum and condemned like sandwich-men to be ridiculous in order to live. (Their appearance recalled to my mind the fact that a “front-of-the-house” inspector at the principal music-hall in France and in Europe is paid thirty sous a night.) They regarded our tickets with gestures of scorn, weariness, and cupidity. None knew better than they that these coloured scraps represented a large lovely gold coin, rare and yet plentiful, reassuring and yet transient, the price of coals, boots, nectar, and love. We came to a very narrow, low, foul, semi-circular tunnel which was occupied by hags and harpies with pink bows in their hair, and by marauding men, and by hats and cloaks and overcoats, and by a double odour of dirt and disinfectants. Along the convex side of the tunnel were a number of little doors like the doors of cells. We bought a programme from a man, yielded our wraps to two harpies, and were led away by another man. All these beings looked hungrily apprehensive, like dogs nosing along a gutter. The auditorium which was nearly full, had the same characteristics as the porch and the couloir. It was filthy, fetid, uncomfortable, and dangerous. It had the carpets of a lodging-house of the ‘seventies, the seats of an old omnibus, the gilt and the decorated sculpture of a circus at a fair. And it was dingy! It was encrusted with dinginess! Something seemed to be afoot on the stage: from the embittered resignation of the audience and the perfunctory nonchalance of the players, we knew that this could only be the curtain-raiser. The hour was ten minutes past nine. The principal piece was advertised to commence at nine o’clock. But the curtain-raiser was not yet finished, and after it was finished there would be the entr’acte—one of the renowned, interminable entr’actes of the Théâtre des Variétés. The Variétés is still one of the most “truly Parisian” of theatres, and has been so since long before Zola described it fully in Nana. The young bloods of Buenos Ayres and St. Petersburg still have visions of an evening at the Variétés as the superlative of intense living. Every theatre with a reputation has its “note,” and the note of the Variétés is to make a fool of its public. Its attitude to the public is that of an English provincial hotel or an English bank: “Come, and he d——d to you! Above all, do not imagine that I exist for your convenience. You exist for mine.” At the Variétés had management is good management; slackness is a virtuous coquetterie. It would never do, there, to be prompt, clean, or honest. To make the theatre passably habitable would be ruin. Its chic would be lost if it ceased to be a Hades of discomfort and a menace to health. There is a small troupe of notorious artistes, some of whom show great talent when it occurs to them to show it; the vogue of the rest is one of the innumerable mysteries which abound in theatrical life. It is axiomatic that they are all witty, and that whatever lines they enunciate thereby become witty. They are simply side-splitting as Sydney Smith was simply side-splitting when he asked for the potatoes to be passed. Also the manager of the theatre always wears an old straw hat, summer and winter. He is the wearer of an eternal battered straw hat, who incidentally manages a theatre. You go along the boulevard, and you happen to see that straw hat emerging from the theatre. And by the strange potency of the hat you will be obliged to say to the next acquaintance you meet: “I’ve just seen Samuel in his straw hat.” And the thought in your mind and in the mind of your acquaintance will be that you are getting very near the heart of Paris. The human interest, no doubt! The Variétés has another rôle and justification. It is what the French call a women’s theatre. When I asked a well-known actress why the entr’-actes at the Variétés were so long, she replied with her air of finding even the most bizarre phenomena quite natural: “There are several reasons. One is, so that the gentlemen may have time to write notes and to receive answers.” I did not conceal my sense of the oddness of this method of conducting a theatre, whereupon she reminded me that it was the Variétés we were talking about. She said that little by little I should understand all sorts of things. As the principal piece progressed—it was an opérette—the apathy of the public grew more and more noticeable. They seemed to have forgotten that they were in one of the most truly Parisian of theatres, watching players whose names were household words and synonyms of wit and allurement. There was no applause, save from a claque which had carried discipline to the extreme. The favourites were evidently in one of their moods of casualness. Either the piece had run too long or it was not going to run long enough. It was a piece brightly and jinglingly vulgar, ministering, of course, in the main, to the secret concupiscence which drives humanity forward; titillating, like most stage-spectacles, all that is base, inept, and gross in a crowd whose units are perhaps, not quite odious. A few of the performers had moments of real brilliance. But even these flashes did not stir the public, whose characteristic was stolidity. A public which, having regard to the conditions of the particular theatre, necessarily consisted of simple snobbish gulls whose creed is whatever they read or hear, with an admixture of foreigners, provincials, adventurers, and persons who, having no illusions, go to the Variétés because they have been to everything else and must go somewhere! The first half-dozen rows of the stalls were reserved for males: a custom which at the Variétés has survived from a more barbaric age, as the custom of the finger-bowl has survived in the repasts of the polite. The self-satisfied and self-conscious occupants of these rows seemed to summarise and illustrate all the various masculine stupidity of a great and proud city. To counterbalance this preponderance of the male, I could glimpse, behind the lath grilles of the cages called baignoires, the forms of women (each guarded) who I hope were incomparable. The sight of these grilles at once sent the mind to the seraglio, and the House of Commons, and other fastnesses of Orientalism. At last, at nearly half after midnight, we came forth, bitterly depressed, as usual, by the deep consciousness of futile waste. I could see, in my preoccupation, the whole organism of the Variétés, which is only the essence of the French theatre. A few artistes and a financier or so at the core, wilful, corrupt, self-indulgent, spoiled, venal, enormously unbusinesslike, incredibly cynical, luxurious in the midst of a crowd of miserable parasites and menials; creating for themselves, out of electric globes, and newspapers, and posters, and photographs, and the inexhaustible simplicity and sexuality of the public, a legend of artistic greatness. They make a frame, and hang a curtain in front of it, and put footlights beneath; and lo! the capricious manouvres of these mortals become the sacred, authoritative functioning of an institution! It was raining. The boulevard was a mirror. And along the reflecting surface of this mirror cab after cab, hundreds of cabs, rolled swiftly. Dozens and dozens were empty, and had no goal; but none would stop. They all went ruthlessly by with offensive gestures of disdain. 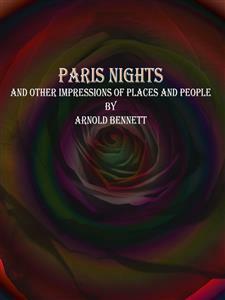 Strangers cannot believe that when a Paris cabman without a fare refuses to stop on a wet night, it is not because he is hoping for a client in richer furs, or because he is going to the stables, or because he has earned enough that night, or because he has an urgent appointment with his enchantress—but simply from malice. Nevertheless this is a psychological fact which any experienced Parisian will confirm. On a wet night the cabman revenges himself upon the bourgeoisie though the base satisfaction may cost him money. As we waited, with many other princes of the earth who could afford to throw away a whole louis for a few hours’ relaxation, as we waited vainly in the wet for a cabman who would condescend, I could savour only one sensation—that of exasperating tedium completely achieved. Ilived up at the top of the house, absolutely alone. After eleven o’clock in the morning, when my servant left, I was my own doorkeeper. Like most solitaries in strange places, whenever I heard a ring I had a feeling that perhaps after all it might be the ring of romance. This time it was the telegraph-boy. I gave him a penny, because in France, much more than in England, every one must live, and the notion still survives that a telegram has sufficient unusualness to demand a tip; the same with a registered letter. I read the telegram, and my evening lay suddenly in fragments at my feet. The customary accident, the accident dreaded by every solitary, had happened. “Sorry, prevented from coming to-night,” etc. It was not yet six o’clock. I had in front of me a wilderness of six hours to traverse. In my warm disgust I went at once out in the streets. My flat had become mysteriously uninhabitable, and my work repugnant. The streets of Paris, by reason of their hospitality, are a refuge. The last sun of September was setting across the circular Place Blanche. I sat down at the terrace of the smallest café and drank tea. Exactly opposite were the crimson wings of the Moulin Rouge, and to the right was the establishment which then held first place among nocturnal restaurants in Montmartre. It had the strange charm of a resort which is never closed, night or day, and where money and time are squandered with infantile fatuity. Somehow it inspired respect, if not awe. Its terrace was seldom empty, and at that hour it was always full. Under the striped and valanced awning sat perhaps a hundred people, all slowly and deliberately administering to themselves poisons of various beautiful colours. A crowd to give pause to the divination of even the most conceited student of human nature, a crowd in which the simplest bourgeois or artist or thief sat next to men and women exercising the oldest and most disreputable professions—and it was impossible surely to distinguish which from which! Out of the medley of trams, omnibuses, carts, automobiles, and cabs that continually rattled over the cobbles, an open fiacre would detach itself every minute or so, and set down or take up in front of the terrace. Among these was one carrying two young dandies, an elegantly dressed girl, and another young girl in a servant’s cap and apron. They were all laughing and talking together. The dandies and the elegancy got out and took a vacant table amid the welcoming eager bows of a maître d’hotel, a chasseur, and a waiter. She was freshly and meticulously and triumphantly got up, like an elaborate confection of starched linen fresh from the laundress. Her lips were impeccably rouged. She delighted the eye by her health and her youth and her pretty insolence. A single touch would have soiled her, but she had not yet been touched. Her day had just begun. Probably, her bed was not yet made. The black-robed, scissored girls of the drapery store at the next angle of the place were finishing their tenth hour of vigil over goods displayed on the footpath. And next to that was a creamery where black-robed girls could obtain a whole day’s sustenance for the price of one glass of poison. Evidently the young creature had only just arrived at the dignity of a fashionable dressmaker, and a servant of her own. Her ingenuous vanity obliged her to show her servant to the place, and the ingenuous vanity of the servant was content to be shown off; for the servant might have a servant to-morrow—who could tell? The cabman and the servant began to converse, and presently the cabman in his long fawn coat and white hat descended and entered the vehicle and sat down by the servant, and pulled out an illustrated comic paper, and they bent their heads over it and giggled enormously in unison; he was piling up money at the rate of at least a sou a minute. Occasionally the young mistress threw a loud sisterly remark to the servant, who replied gaily. And the two young dandies bore nobly the difficult rôle of world-worn men who still count not the cost of smiles. Say what you like, it was charming. It was one of the reasons why Paris is the city which is always forgiven. Could one reasonably expect that the bright face of the vapid little siren should be solemnised by the thought: “To-day I am a day nearer forty than I was yesterday”? The wings of the Moulin Rouge, jewelled now with crimson lamps, began to revolve slowly. The upper chambers of the restaurant showed lights behind their mysteriously-curtained windows. The terrace was suddenly bathed in the calm blue of electricity. No austere realism of the philosopher could argue away the romance of the scene. I turned down the steep Rue Blanche, and at the foot of it passed by the shadow of the Trinité, the great church of illicit assignations, at whose clock scores of frightened and expectant hearts gaze anxiously every afternoon; and through the Rue de la Chaussée d’Antin, where corsets are masterpieces beyond price and flowers may be sold for a sovereign apiece, and then into the full fever of the grand boulevard with its maddening restlessness of illuminated signs. The shops and cafés were all on fire, making two embankments of fire, above which rose high and mysterious façades masked by trees that looked like the impossible verdure of an opera. And between the summits of the trees a ribbon of rich, dark, soothing purple—the sky! This was the city. This was what the race had accomplished, after eighteen Louises and nearly as many revolutions, and when all was said that could be said it remained a prodigious and a comforting spectacle. Every doorway shone with invitation; every satisfaction and delight was offered, on terms ridiculously reasonable. And binding everything together were the refined, neighbourly, and graceful cynical gestures of the race; so different from the harsh and awkward timidity, the self-centred egotism and artistocratic hypocrisy of Piccadilly. It seemed difficult to be lonely amid multitudes that so candidly accepted human nature as human nature is. It seemed a splendid and an uplifting thing to be there. I continued southwards, down the narrow, swarming Rue Richelieu, past the immeasurable National Library on the left and Jean Goujon’s sculptures of the rivers of France on the right, and past the Theatre Français, where nice plain people were waiting to see L’Aventurière, and across the arcaded Rue de Rivoli. And then I was in the dark desert of the Place du Carrousel, where the omnibuses are diminished to toy-omnibuses. The town was shut off by the vast arms of the Louvre. The purple had faded out the sky. The wind, heralding October, blew coldly across the spaces. The artfully arranged vista of the Champs Elysées, rising in flame against the silhouette of Cleopatra’s needle, struck me as a meretricious device, designed to impress tourists and monarchs. Everything was meretricious. I could not even strike a match without being reminded that a contented and corrupt inefficiency was corroding this race like a disease. I could not light my cigarette because somebody, somewhere, had not done his job like an honest man. And thus it was throughout. I wanted to dine, and there were a thousand restaurants within a mile; but they had all ceased to invite me. I was beaten down by the overwhelming sadness of one who for the time being has no definite arranged claim to any friendly attention in a huge city—crowded with pre-occupied human beings. I might have been George Gissing. I re-wrote all his novels for him in an instant. I persisted southwards. The tiny walled river, reflecting with industrious precision all its lights, had no attraction. The quays, where all the book shops were closed and all the bookstalls locked down, and where there was never a café, were as inhospitable and chill as Riga. Mist seemed to heave over the river, and the pavements were oozing damp. I went up an entry and rang a bell, thinking to myself: “If he isn’t in, I am done for!” But at the same moment I caught the sound of a violoncello, and I knew I was saved, and by a miracle Paris was herself again. “Not engaged for dinner, are you?” I asked, as soon as I was in the studio. The studio was fairly large, but it was bare, unkempt, dirty, and comfortless. Except an old sofa, two hard imperfect chairs, and an untrustworthy table, it had no furniture. Of course, it was littered with the apparatus of painting. Its sole ornamentation was pictures, and the pictures were very fine, for they were the painter’s own. He and his pictures are well known among the painters of Europe and America. Successful artistically, and with an adequate private income, he was a full member of the Champ de Mars Salon, and he sold his pictures upon occasion to Governments. Although a British subject, he had spent nearly all his life in Paris; he knew the streets and resorts of Paris like a Frenchman; he spoke French like a Frenchman. I never heard of him going to England. I never heard him express a desire to go to England. His age was perhaps fifty, and I dare say that he had lived in that studio for a quarter of a century, with his violoncello. It was plain, as he stood there, well dressed, and with a vivacious and yet dreamy eye, that the zest of life had not waned in him. He was a man who, now as much as ever, took his pleasure in seeing and painting beautiful, suave, harmonious things. And yet he stood there unapologetic amid that ugly and narrow discomfort, with the sheet of music pinned carelessly to an easel, and lighted by a small ill-regulated lamp with a truncated, dirty chimney—sole illumination of the chamber! His vivacious and dreamy eye simply did not see all that, never had seen it, never saw anything that it did not care to see. Nobody ever heard him multiply words about a bad picture, for example,—he would ignore it. With a gesture of habit that must have taken years to acquire he took a common rose-coloured packet of caporal cigarettes from the table by the lamp and offered it to me, pushing one of the cigarettes out beyond its fellows from behind; you knew that he was always handling cigarettes. “I wish you’d play it,” I said. He sat down and played it, because he was interested in it. With his greying hair and his fashionable grey suit, and his oldest friend, the brown ’cello, gleaming between his knees, he was the centre of a small region of light in the gloomy studio, and the sound of the ’cello filled the studio. He had no home; but if he had had a home this would have been his home, and this his home-life. As a private individual, as distinguished from a public artist, this was what he had arrived at. He had secured this refuge, and invented this relaxation, in the middle of Paris. By their aid he could defy Paris. There was something wistful about the scene, but it was also impressive, at any rate to me, who am otherwise constituted. He was an exile in the city of exiles; a characteristic item in it, though of a variety exceedingly rare. But he would have been equally an exile in any other city. He had no consciousness of being an exile, of being homeless. He was above patriotisms and homes. Why, when he wanted even a book he only borrowed it! “Well, shall we go out and eat?” I suggested, after listening to several lovely airs. I did care to see it, but I also desired my dinner. “This is a pretty good print, but I shall get better,” he said, holding the sheet of paper under the lamp. “How many shall you print?” I asked. “All right. I think it will give you pleasure,” he said with impartial and dignified conviction. After another ten minutes, we were put on the quay. “Grand autumn night?” he said appreciatively. “Where shall we have the apéritif? “I think we shall have time for an apéritif” he insisted, mildly shocked. Drawing-rooms have their ritual. His life, too, had its ritual. At nearly midnight we were sitting, three of us, in a café of the Montparnasse quarter, possibly the principal café of the Montparnasse quarter. Neither notorious nor secretly eccentric; but an honest café, in the sense of “honest” applied to certain women. Being situated close to a large railway terminus, it had a broad and an indulgent attitude towards life. It would have received a frivolous habitué of the Place Blanche, or a nun, or a clergyman, with the same placidity. And although the district was modified, and whole streets, indeed, de-Parisianised by wandering cohorts of American and English art-amateurs of both sexes, this café remained, while accepting them, characteristically French. The cohorts thought they were seeing French life when they entered it; and they in fact were. This café was the chief club of the district, with a multitudinous and regular clientèle of billiard-players, card-players, draught-players, newspapers readers, chatterers, and simple imbibers of bock. Its doors were continually a-swing, and one or the other of the two high-enthroned caissières was continually lifting her watchful head from the desk to observe who entered. Its interior seemed to penetrate indefinitely into the hinterland of the street, and the effect of unendingness was intensified by means of mirrors, which reflected the shirt-sleeved arms and the cues of a score of billiard-players. Everywhere the same lively and expressive and never ungraceful gestures, between the marble table-tops below and the light-studded ceiling above! Everywhere the same murmur of confusing pleasant voices broken by the loud chant of waiters intoning orders at the service-bar, and by the setting down of heavy glass mugs and saucers upon marble! Over the café, unperceived, unthought of, were the six storeys of a large house comprising perhaps twenty-five separate and complete homes. The third man at our table was another exile, also a painter, but a Scotchman. He had lived in Paris since everlasting, but before that rumour said that he had lived for several years immovable at the little inn of a Norman village. Now, he never left Paris, even in summer. He exhibited, with marked discretion, only at the Indépendants. Beyond these facts, and the obvious fact that he enjoyed independent means, nobody knew anything about him save his opinions. Even his age was exceedingly uncertain. He looked forty, but there were acquaintances who said that he had looked forty for twenty years. He was one of those extremely reserved men who talk freely. Of his hopes, ambitions, ideals, disappointments, connections, he never said a word, but he did not refuse his opinion upon any subject, and on every subject he had a definite opinion which he would express very clearly, with a sort of polite curtness. His tendency was to cynicism—too cynical to be bitter. He did not complain of human nature, but he thoroughly believed the worst of it. These two men, the ’cellist and the Scotchman, were fast friends; or rather—as it might be argued in the strict sense neither of them had a friend—they were very familiar acquaintances, each with a profound respect for the other’s judgment and artistic probity. Further, the Scotchman admired his companion for a genius, as everybody did. They talked together for ever and ever, but not about politics. They were impatient on politics. Both were apparently convinced that politics are an artificiality imposed upon society by adventurers and interferes, and that if such people could be exterminated politics would disappear. Certainly neither had any interest in the organic aspect of society. Their political desire was to be let alone. Nor did they often or for long “talk bawdy”; after opinions had been given which no sensible man ever confides to more than two reliable others at a time, the Scotchman would sweep all that away as secondary. Nor did they talk of the events of the day, unless it might be some titillating crime or mystery such as will fill whole pages of the newspaper for a week together. They talked of the arts, all the arts. And although they seemed to be always either in that café, or in their studios, or in bed, they had the air of being mysteriously but genuinely abreast of every manifestation of art. And since all the arts are one, and in respect to art they had a real attitude and real views, all that they said was valuable suggestively, and their ideas could not by any prodigality be exhausted. As a patron of the arts even the State interested them, and herein they showed glimmerings of a social sense. In the intervals of this eternal and absorbing “art,” they would discuss with admirable restrained gusto the exacerbating ridiculousness of the cohorts of American and English art-amateurs who infested and infected the quarter. Occasionally a bore would complacently present himself for sufferance. Among these the chief was certainly the man whose existence was an endless shuttle-work between the various cities where art is or has been practised, from Munich to Naples. He knew everything about painting, but he ought to have been a bookmaker. He was notorious everywhere as the friend of Strutt, Strutt being the very famous and wealthy English portrait-painter of girls. All his remarks were àpropos of Tommy Strutt, Tommy Strutt—Tommy. He was invariably full of Tommy. And this evening he was full of Tommy’s new German model, whose portrait had been in that year’s Salon.. . . How Tommy had picked her up in the streets of Berlin; how she was nineteen, and the rage of Berlin, and was asked to lunch at the embassies, and had received five proposals in three months: how she refused to sit for any one but Tommy, and even for him would only sit two hours a day: how Tommy looked after her, and sent her to bed at nine-thirty of a night, and hired a woman to play with her; and how Tommy had once telegraphed to her that he was coming to Berlin, and how she had hired a studio and got it painted and furnished exactly to his fastidious taste all on her own, and met him at the station and driven him to the studio, and tea was all ready, etc. ; and how pretty she was.. . .
“What’s her figure like?” the Scotchman inquired gruffly. “‘The old place in Kildare!’” murmured the Scotchman, in a peculiarly significant tone, after Tommy Strutt’s friend had gone; and this was the only comment on Tommy Strutt’s friend. The talk on art was resumed, the renowned Tommy Strutt being reduced to his proper level of the third-rate and abruptly dismissed. One o’clock! A quarter past one! The café was now nearly empty. But these men had no regard for time. Time did not exist for them, any more than the structure of society. They were not bored, nor tired. They conversed with ease, and with mild pleasure in their own irony and in the disillusioned surety of their judgments. Then I noticed that the waiters had dwindled to two, and that only one cashier was left enthroned behind the bar; somewhat later, she too had actually gone! Both had at length rejoined their families, if any. The idea was startling that these prim and neat and mechanically smiling women were human, had private relations, a private life, a bed, a wardrobe. All over Paris, all day, every day, they sit and estimate the contents of trays, which waiters present to their practised gaze for an instant only, and receive the value of the drinks in bone discs, and write down columns of figures in long ledgers. They never take exercise, nor see the sun; they even eat in the café. Mystic careers!... A quarter to two. Now the chairs had been brought in from the terrace, and there was only one waiter, and no other customer that I could see. The waiter, his face nearly as pale as his apron, eyed us with patient and bland resignation, sure from his deep knowledge of human habits that sooner or later we should in fact depart, and well inured to the great Parisian principle that a café exists for the convenience of its habitués. I was uneasy: I was even aware of guiltiness; but not my friends. Then a face looked in at the doorway, as if reconnoitring, and hesitated.